All Thornton minors have an assigned academic advisor. Minors are not required to meet with their advisor, but usually need to obtain departmental clearance (“D-clearance”) to take specific courses for their minor. D-clearances may be requested by email. Refer to your STARS report on OASIS to view your minor requirements. 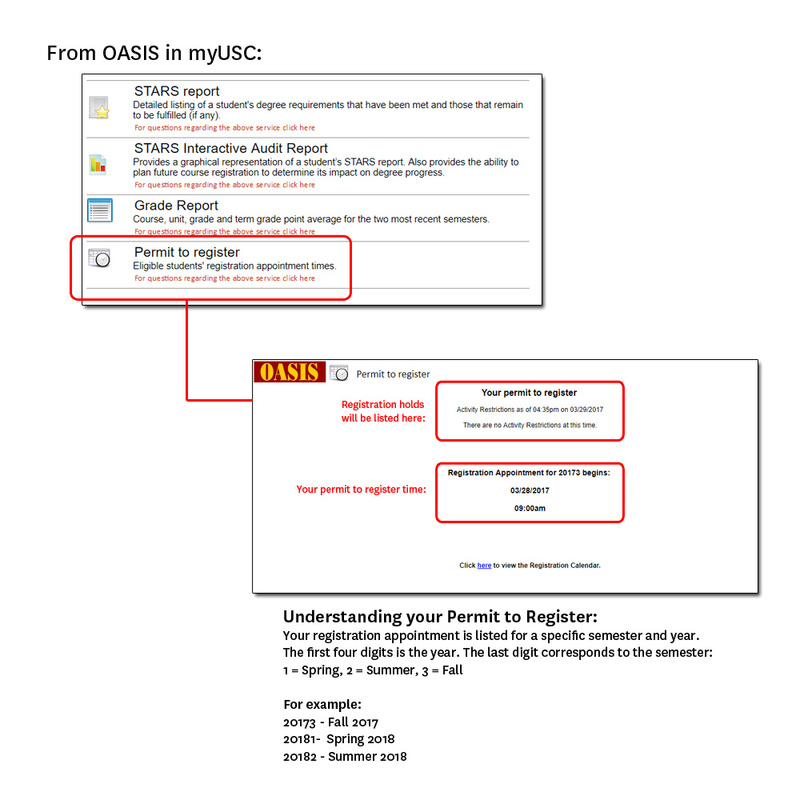 OASIS is accessible through your myUSC page. Please see below for detailed instructions on D-clearance requests and registration preparation. D-clearance can be obtained by emailing your advisor during your priority D-clearance week. Appointments can be made to discuss other issues not related to D-clearance by emailing your advisor. 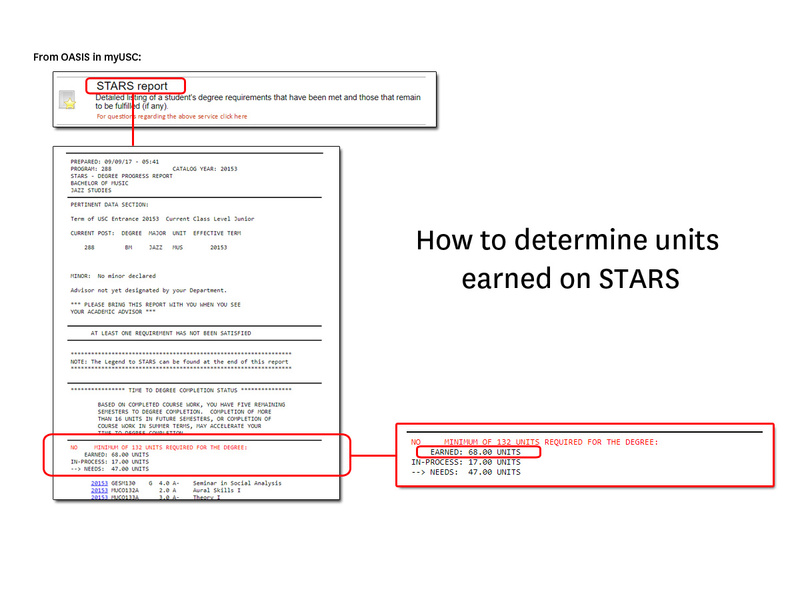 REVIEW your STARS report (accessible via OASIS in myUSC). Make a note of minor program requirements that you have completed, courses currently in progress, and courses still left to complete. BUILD a proposed schedule on Web Registration (accessible via myUSC). Be sure to review the requirements for your minor as listed in the USC Catalogue for the appropriate Catalogue year. Individual Instruction Courses – If you are planning to take individual instruction (e.g. MPKS 301), you must complete an Individual Instruction Request Form on the computers located at our office in TMC 200. You will be notified via email when your D-clearance for individual instruction has been issued. When you receive D-clearance, officially REGISTER using Web Registration for the course(s) you were given clearance to add, as well any other appropriate course(s) that do not require clearance. (In general, D-clearances issued during the priority D-clearance weeks are set to expire on the last day of classes for the current semester.) Important: it is always your responsibility to register for your classes on the Web Registration system. Your advisor will only grant you clearance to register, but you will need to officially register for the courses for which your advisor has granted you clearance. For individual instruction courses (e.g. MPKS 301), you must complete an Individual Instruction Request Form on the computers located at our office in TMC 200. All other D-clearances for required courses in your minor are issued by your academic advisor. Please follow the process described above to request D-clearance. Classes have already started for the semester. How do I request D-clearance? How do I know which classes are required for my music minor? Please refer to your STARS report for minor requirements. You can also refer to the USC Catalogue or the minor requirements lists here. Please note that your required courses will depend on the Catalogue year you are following, which is usually the year you started at USC. If you have questions about your specific minor requirements or your Catalogue year, please email your minor advisor. I’m a declared music minor. Why can’t I register for my minor classes? As a music minor, you are not automatically cleared for minor courses. You will need to request D-clearance each semester for the courses you wish to take that are part of the minor curriculum. Music majors and minors are given priority to request D-clearance for required courses. Thornton Student Affairs sends out an email each semester when it’s time to begin planning classes for the following semester and when you are able to request D-clearance. Information on advising and registration schedules is described in the Advisement and Registration process above. I’m a music major. How can I obtain D-clearance for my music minor? Please request D-clearance for your minor classes from your major advisor during your mandatory advisement appointment each semester. I’m planning to add a music minor, but I’d like to take classes now. How do I obtain D-clearance? Please visit our office in TMC 200 or contact us at (213) 740-4721 for instructions on the Thornton non-major/non-minor D-clearance request process. Declared music majors and minors are given priority to request D-clearance for required courses, so we will evaluate your D-clearance request after priority advisement for current Thornton majors and minors. I’ve completed my music minor requirements, and I want to take more minor classes. How do I obtain D-clearance? Please follow the D-clearance advising process here. We prioritize D-clearance requests from major and minor students who have unfulfilled requirements, so we will consider your D-clearance request after priority advisement for current Thornton majors and minors.